Bittondi SALA exhibition Imprimatur opened at Murray Bridge Regional Gallery on 22 July 2016. Rita Hall spoke at the opening event. 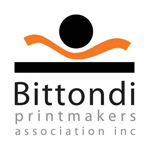 Bittondi Printmakers reflect on the past, evoking the history that has shaped the landscape, community and industry of Murray Bridge. Elizabeth Banfield, Beth Evans, Geoff Gibbons, Amanda HAssett, Grace Myers, Mary Pulford, Wendy Rushby, Mei Sheong Wong, Sarah Thame, Veronica Thurley, Julia Wakefield, Kay Walker, Wendy Wright.